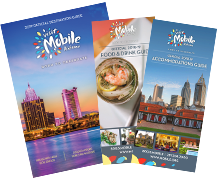 Visit Mobile is the official point of contact for leisure travelers, convention and meeting planners, bus tour operators and travel agents. Visit Mobile is also the primary marketing agency to attract the aforementioned audiences. Visit Mobile Administrative Offices are located on the 4th floor of the Arthur R. Outlaw Convention Center at 1 S. Water Street, Mobile, AL, 36602. You can reach us by call 251-208-2000. Visit Mobile Welcome Center is located in The History Museum of Mobile at 111 Royal Street, Mobile, AL 36602. For questions about visiting Mobile call 251-208-7304. 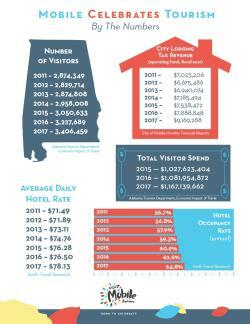 Visit Mobile is charged with attracting visitors and conventions to the Mobile area to experience and enjoy our history, culture and attractions in order to further strengthen Mobile&apos;s image as a national destination, increasing economic stability and enhancing the region&apos;s quality of life. Mobile will become the safest, most business and family-friendly city in America by 2020. Realizing this vision means a better quality of life for everyone in the city. Every decision made and action taken must be done under the premise of helping to accomplish the vision. Visit Mobile is proud to be accredited by the Destination Marketing Accreditation Program (DMAP) of Destinations International.